The IBM 407 Accounting Machine (1949). This was the last and best of the all-electro­mechan­ical IBM accounting machines (previously known as tabulators). The 407 reads a deck of punched cards on its integrated card reader (left), accumulates totals, subtotals, or other simple statistics in counters made of gears, and prints the results on its integrated 120-column line printer (center). Speed: 100 to 150 cards per minute (the 407 replaced the earlier typebar printing technology with a much faster print wheel mechanism). As with all IBM punch-card equip­ment except the key punch and sorter, a control panel is wired to specify the details of operation: what card columns to read and what to do with them, how to format the report. Although the 407 is really just a big adding machine, creative use could be made of the control program; for example, as described by Roger L. Boyell in Programmed Multiplication on the IBM 407 , Journal of the ACM, Volume 4, Number 4, October, 1957, pp.442-449. In 1955, the 407 was adapted to act as an input/output device for the IBM 650 computer, and would later perform similar roles for other IBM calculators (such as the CPC-II) and computers (7090); reportedly, a 407 even served as the "system clock" for Columbia's 7094. Fred Stone points out, "The speed was a function of what you were doing. If you were just posting, reading a card and printing, the maximum speed was a whopping 150 cards per minute. 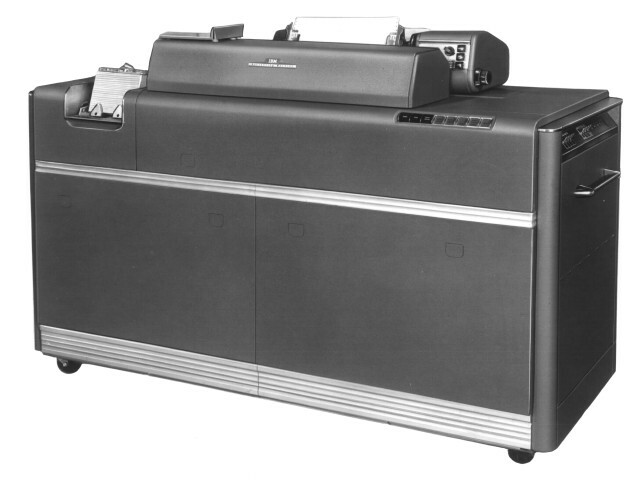 There was a model E8, that was offered with the IBM 1620 to be used as an offline printer. That was a stripped unit that would skip every third cycle and was crippled to run at 100 cards per minute. With the purchase of 2 relays (if I remember corectly) and adding a jumper you could defeat the crippling circuitry and get it back to 150 cpm." Mike McCants, a 1620 programmer at Rice University in the 1960s, comments (November 2002), "As one who helped perform such a modification in 1963, my memory is a little different. There were already two extra relays in this model E8. The purpose of the two extra relays was to count 1, count 2, and then cause the machine to pause. Thus the 150 cards/minute printer was slowed to 100 cards/minute. My memory is that it took us only an hour or so to read the documentation in the back of the cabinet and figure out how to bypass the two relays and restore the 407 to its rated speed of 150 cards/minute. This happened about one hour after the SE finished installing the machine :-)"
The control panel was about 16 inches square with metal rim and grasping handle, containing a matrix of holes sectioned off into functional areas with small labels printed in white. 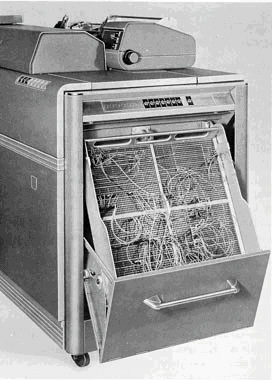 To program the machine to do a particular task (such as read a deck of cards, print each card in a certain format, add up the numbers in columns 40-48, and print the total), jumper wires of various lengths and colors were inserted to connect pairs of holes, such as card columns to printer columns, card columns to accumulators, and (always) "CI to C". When your program is complete, you open the door on the right, put in the control panel, then close the door; thus different programs could be easily swapped in and out. Various other IBM EAM and unit record equipment were programmed the same way. Probably the most common (and certainly most mundane) use of the 407 in later years was offline listing of card decks onto paper. Photo: From the website of Gary Eheman at IBM, used by permission. The control panel programmer is his dad. (I was doing the same thing in the Army 10 years later, but with considerably fewer stripes.) The 407 photo is from the IBM archive and the programming photo was an Army recruiting shot. Reference Manual, IBM 407 Accounting Machine , International Business Machines Corporation, Data Processing Division, 112 East Post Road, White Plains, New York: A24-1011-0 (1950). Columbia University Machine Room Gallery 1965. Overview of IBM Tabulators and Accounting Machines. Herman Hollerith and his 1890 Census Tabulator.